Ten of the oddest and most interesting food festivals from across the globe. Throwing tomatoes, carving radishes, eating spam and celebrating cheese curd. These are some of the experiences you might encounter at unusual food festivals around the world. From the hills of Tuscany to the beaches of Hawaii, our globe certainly hosts some unusual, sometimes downright weird, events. 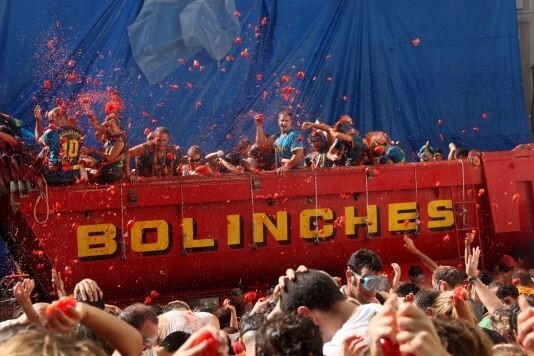 For 70 years, the Spanish village of Buñol has hosted La Tomatina festival on the last Wednesday of August. It started in 1945 when a local fell off his float during a parade and got annoyed, resulting in locals pelting each other with tomatoes from a nearby vegetable stall. And so began a tradition. The festival was banned in the early 50s, but in 1957 the locals staged a ‘tomato burial’ in protest at the ban and festivities were reinstated. Participants are told to squash the tomatoes before throwing them so that the hit will be less painful. An amusing side-event is the palo-jabón, a soapy pole with a Spanish ham on top – whoever can make it to the top gets the ham. There’s also a kids’ Tomatina the Saturday before. It’s called Rabechilbi Richterswil, and it’s Europe’s largest turnip festival. Taking place in November, on the second Saturday after Halloween, it involves 26 tonnes of carved turnips being paraded around the village of Richterswil on Lake Zurich. The turnips are hollowed out, elaborately decorated, and used as lanterns with candles inside. Festivities include a parade of illuminated floats through the village at night, and the entire place is decorated with carved turnip lanterns. It was 1937 when the first blue and yellow tins came off the production line, but if you thought this canned meat’s heyday was over, think again. You can celebrate Monty Python’s favourite tinned food in Austin, Minnesota, the home of Hormel, the makers of Spam, during a weeklong festival in early July. Treats include Spam kabobs, nachos and pizza. Waikiki in Hawaii also holds a one-day SPAMJam Street Festival in May – more Spam is eaten per person in Hawaii than any other US state. Top restaurants take part, there’s free entertainment and fundraising events for the Hawaii Foodbank. It’s not all about The Leafy One at the Yuma Lettuce Days Fest. It actually started as a celebration of the agricultural industry of Yuma in Arizona and so all vegetables are honoured. Celebrity chefs host cooking demos, alongside vegetable carving, live entertainment, a giant salad bar, beer garden, and cooking competitions. It takes place at the University of Arizona's Yuma Agricultural Center (YAC), a working research farm in the Yuma Valley. Wannabe growers can learn about lettuce growing, irrigation and explore the ‘spinach trial’ planting area which has over 80 varieties. Remember those innocent harvest festivals at school, where everyone brought in tinned goods to donate? Marlington, West Virginia does it differently, with a roadkill cook-off where cooks rustle up dishes such as squirrel gravy over biscuits, teriyaki-marinated bear and deer sausage. It’s definitely different with the Travel Channel, Food Network and Discovery Channel all covering the madness. Cooking starts at 9am, judging takes place at noon and visitors can taste dishes after 11am. There’s also music, biscuit bake-offs, harvest games, dog shows and craft shows, and plenty more to cater for the roadkill-averse. Pickled ram’s testicles, whale blubber, sheep’s heads, rotten shark – these Icelandic staples are all celebrated during the midwinter festival from 23rd January to 23rd February. Known as Þorrablót in Icelandic – or the Ugly Food Festival by others – it honours the Norse god Thor with a huge feast. Restaurants in Reykjavik will often do special menus, but don’t worry. Alongside the boiled sheep’s head are other traditional dishes such as rye bread and smoked salmon. This festival is not just about cheese, but specifically cheese curd. The Midwest town of Ellworth, Wisconsin, has dubbed itself the ‘cheese curd capital’ and the June festival, run by the Ellsworth Cooperative Creamery, is a chance to sample treats such as cheese curd brats and deep-fried curds. There’s entertainment, sports events, a cheese curd pie competition and cheese curd dessert contest, a parade, and a timed eating contest for serious curd-eaters. The 2015 edition’s theme was ‘Love, Peace and Curds’. Pumpkins for Halloween… and radishes for Christmas. On 23rd December, the Mexican city of Oaxaca hosts unusual food and folk art festival La Noche de los Rábanos. The unshowy radish takes centre stage, with locals carving beautiful sculptures such as animals, Jesus, and even Mexico’s revolutionary hero Emiliano Zapato. Carving starts three days before and by the afternoon of the 23rd, the Zocalo (main square) is packed with contestants and carvings. These aren’t tiny salad radishes either. Specially grown, they’re up to 50cm long, ten centimetres wide and can weigh up to three kilos. There’s nothing too unusual about this – apart from the fact it’s held in Italy. Known as Sagra Del Pesce e Patate, the locals of Barga, Tuscany, hold this three-week summertime fest to celebrate a most un-Italian of dishes. Its roots lie in Barga’s connections with Scotland, where many emigrants flocked during World War One. The town is even twinned with East Lothian. But it comes with an Italian twist. Traditional battered fish and chips is served with tomato salsa and a glass of Chianti. Love it or hate it, it’s the island’s biggest summer festival, taking place just outside Newchurch. With garlic and food marquees and cooking demonstrations from the island chefs in a new theatre kitchen, this is heaven for garlic lovers with treats such as garlic fudge, garlic biscuits and garlic popcorn on offer. The festival’s star is Britain’s best most pungent garlic, grown on the Isle of Wight by the award-winning Garlic Farm. It’s not all about the tasty bulb – there’s a beer tent, live music, craft stalls and delicious local cheeses, meats, honey, wine and cider. Have you come across any unusual food festivals on your travels? Tell us about them in the comments below.